Small LED panels, hand held by an assistant, prove very worthwhile. And the Panasonic GH3 Rocks! 1. Tripods and motion in general. You can read about techniques and best practices but I'm here to tell you that smooth tripod pans and tilts, as well as dolly moves and slider moves, require practice. Lots and lots of practice if you want to do it right. As still photographers we have the benefit of stopping the motion in each frame which masks any sort of instability over time. I found that I needed to practice even a simple move over and over again to get it right and I can see that hand skills and even how you position your body to begin and end moves with a camera are very important. If I want to be competent at actually shooting video I can see that I'll be doing some weekly practice to become and then stay proficient. 2. Color Balance. When we shoot still images with flash we can overwhelm existing (non-daylight) sources and have a reasonable assurance that our color will fall into a good range that we can easily manage in post production. And, if we really screw up we can always take raw files and do almost supernatural saves with them. But in the kind of video I'm shooting we don't have raw (at least not convenient and usable raw within the eco-budget) and we only have 8 bit color with which to work. This means that we really need to concentrate on nailing the color and exposure, in camera, for all the crucial "A-roll" shots. Ben and I lit our critical shots and any shot that needed lighting. 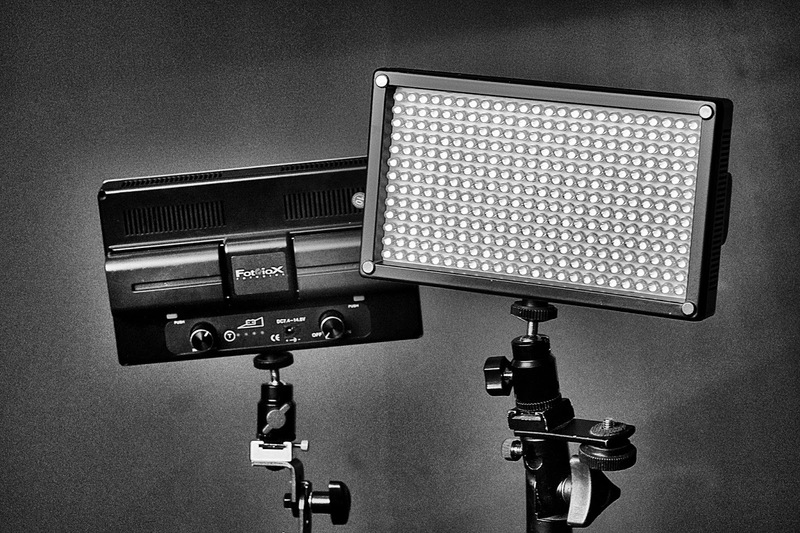 In each new lighting venue we took the time to do a custom white balance for each shooting camera. By taking that step I think I gave myself a fighting chance of being able to edit together footage from both cameras without a big visual disconnection. And I think that's critical. We used a Lastolite pop-up gray/white target all the way through our shooting day to ensure uniformity in each location. Looking (and logging) the material today allowed me to breathe a little sigh of relief because I could see on my monitor that the two different cameras in the same shooting scenario match up well. 3. Shooting more is better. When I looked through our takes today I found little glitches (human error) here and there that might render a clip unusable. We shot a lot and I thought we might be overshooting until I look at the content we got and starting figuring out where it would go on the time line. Then I realized that you can never have too much content to cut to. It makes the final edit that much easier. 4. You have to compose for a moving frame. In still imaging I spend time getting one frame just right. It's almost like just considering the x and y coordinates and not taking time into consideration. In video you have to figure out where your framing will end up as you move the camera, not just what kind of framing looks good as you start the shot. An interesting (and mentally taxing) exercise in working in four dimensions. (X, Y, Depth and Time). 6. It's kind of cool to move the lights! In stills we work mostly with locked down lighting. We put lights on a stand and take the shot. In video you can actually move the lights during a shot. In fact, if the camera is moving it might be best to also move lights. This opens up lots of cool creative opportunities. I had Ben hand hold a small light panel and move it over the top of a product we were shooting. I was sliding the camera in one direction and he was moving the light in the opposite direction and it was a neat effect as the product fell into dark. 7. If you are using multiple cameras it's wise to slate each shot. Using multiple cameras for interviews gives you a lot more flexibility in editing but it does mean you have to have some way to sync up the shots. I think it's easiest to do this with a slate. I found a digital slate that works very well on the iPad and it runs time code across the top bar which means that you can sync up to the absolute frame you want. Best $10 I've spent in a while. I find an angle that both cameras can see and off we go. Neat thing about the digital slate is that one tap of the color bars at the top of the slate gives me a full screen of of MacBeth color chart and a series of black/gray/white patches. Nice. 8. Use a camera that allows you to "punch in" for magnified fine focusing and use manual lenses. I loved using the GH3 cameras and I'm glad I bought two. It meant that I had two cameras that worked the same and generated exactly the same kind of files. With the same family color. The GH3 takes manual focus legacy lenses and, with two pushes of a back of camera button, gives me a quick magnified view to fine focus on. When I got back to the studio the files were amazingly sharp. Have I written how much I love these cameras? It's true. The files they generate are so nice I haven't even started pining for the new GH4 (although it is available for pre-order....). 9. Finally, what the pros all say is true----monitor your sound with headphones all the time. One spot check might find everything to be hunky-dory but twenty minutes later the microphone transmitter battery might crap out or the plug on the side of the camera might have escaped its mooring. Or the interviewee's microphone might become dislodged and start rubbing against his shirt. If you have those phones on you'll hear it. And you can fix it. Not so easy after the fact. The other thing I learned is that video is a lot like still photography; the real work is still all about hauling in the gear, cleaning up the shooting space, working with the talent, getting the tech details right and then packing it all up again and moving to a new location. Moving furniture. Anyway---just wanted to share what I learned (again) last week. Maybe finding a group of elderlies doing Tai Chi in the park is not the worst idea. Every time I see one of those groups standing on one foot, drying an imaginary dish while slowly rotating the body before gently planting the other foot it looks like an exercise for handheld video / cinema camera work. Hi Dennis, If we are slating two cameras we try to find an angle at which we can place the slate so both cameras can "see" it. One camera may have to move over a bit to see the slate and then be repositioned after it is running but before we actually do the "take." Even if the cameras see the slate at an angle the important thing is being able to ready the big time code running across the top. In that way in editing we can find the exact frame in the footage from each camera and it will match up perfectly. If we miss the slate on a two camera set up but we've run audio on both cameras we can pull both clips into final cut pro X 10.1 and there is a feature that syncs the clips by comparing the topography of their sound tracks. The full Arnold Newman quote is "photography is 1 percent talent and 99 percent moving furniture." Apparently most art is a moveable feast. Performers and musicians haul gear, still and video photographers are also in the moving business. I suppose can't be helped. Satisfaction comes with the success of a beautiful performance, shot, video etc. Pack it up and move to the next gig (sigh). Syncing video by comparing, aligning and locking to the waveforms of their soundtracks -- now that's a devilishly clever idea. Another one I didn't have. Rats.